Terry Weyna: I’d hoped for discussion of things like how to move from writing short stories into writing novels. That still doesn’t seem like an easy transition to me. But despite the lack of practical information, we had a good time, right? Marion: Oh, yeah, there was no shortage of entertainment. 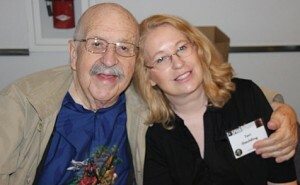 The weekend kick-off, “SF in SF,” featuring Grand Master Connie Willis and soon-to-be Grand Master Gene Wolfe, was great fun. Gene Wolfe was accompanied by his daughter Teri Goulding, and she and Terry got into a fine conversation about growing up in the Midwest — but that was a sidelight. 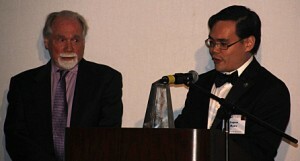 The remarks and the reading were moderated by writer Terry Bisson, who founded SF in SF, an (obviously) San Francisco-based group that discusses SF, puts on events and collects money for the Variety Children’s Charity via a cash bar at their meetings. Bisson is a generous and humble moderator. Willis is as charming, smart and funny as her books, and Gene Wolfe seemed almost like a magical being; smart, a little vague at times, but always ready with the perfect wisecrack. Terry: Willis read from a work-in-progress, a short story about a storefront that appears to be a used bookstore in Manhattan, but is actually a portal for something very different. I love books and stories about books, so I’m looking forward to reading this one in its entirety. Wolfe shared a middle chapter from his book, Evil Guest, where the protagonist, an actress named Cassie Casey, who has been swept away to a south sea island to be made queen, sees her palace for the first time. Marion: Both writers took questions. Willis talked about how much she loves to do research and shared a few humorous stories about people who write to her to tell her she got it wrong (it’s especially amusing when she hasn’t). An audience member asked Wolfe if he used archaic terms such as “destrier” and “athame” in his series, THE BOOK OF THE NEW SUN, as a way to create a sense of otherness; Wolfe said yes, but mainly he wanted to use archaic and unfamiliar words to let the reader know that the thing was not exactly a horse or a knife. Then he drifted into a delightful and unrelated story about a horse that ran away with him one time when he was a young man. It had nothing to do with writing but it was great. Terry: The panels started on Friday and continued through Sunday morning. I attended one on “Writing in Someone Else’s Universe,” about shared universe collections or writing something like a DARKOVER, STAR TREK or STAR WARS novel. The panelists, Terry Bisson, William C. Dietz, Deborah J. Ross, John Scalzi and Robert Silverberg, agreed that it is the obligation of writers to honor the spirit of the universe, and strive to be harmonious, rather than consistent, with the original vision. Deborah Ross said something I’d never noticed about Darkover: Marion Zimmer Bradley deliberately wasn’t herself consistent from book to book. It’s impossible to map Darkover, because Bradley moved her cities around. That sure makes it easy for others to write about the world you invented! Marion: I attended the panel on writing YA science fiction. 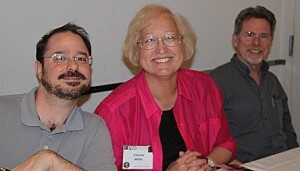 The panelists were Andre Norton Award Winner E.C. Myers; Sarah Beth Durst, Leah Bobet and Steven Gould. This was a fun, dynamic panel. The panelists were in agreement these days that basically the only thing that distinguishes a Young Adult book is the age of the protagonist. Pretty much any genre and theme are up for grabs. Surprisingly, none of them had their work censored by editors or publishers, although Gould did say his book Jumpers ended up on a banned books list because of a statement made on page 2 and a scene on page 9. Terry: Another panel was entitled “Approaches to Writing,” and the panelists — Joe Haldeman, Jon DeCles, Cat Rambo, and Rachel Swirsky — talked about their habits. Haldeman gets up early, gets himself prepared, and then bicycles off to one of nine coffee shops within riding distance of his home, where he writes in longhand in a blank book. He showed us his current novel-in-progress, with its fold-out outline in the front and lots of notations. He writes about 250 words a day — about a page — and types it all up when he gets home. Swirsky, on the other extreme, sounds almost entirely undisciplined about her writing; she writes when inspiration strikes, so far as I could tell. It’s obviously working for her, as she had one of the Nebula-nominated novelettes, “Portrait of Lisane da Patagnia,” this year (I’ve read it and found it excellent) (and I suspect she’s rather more disciplined than she let on). But what I really took away from the panel is that there are as many ways to write as there are novels and stories to write. And more than that, it seems like discipline is a better approach than not. Haldeman said one should write at the same time and in the same place every day. Someday I’m going to try that. Marion: I covered “Writing the Other,” in Thoughtful Thursday. The panelists were Kim Stanley Robinson, Ken Liu, who moderated, Aliette de Bodard and Saladin Ahmed. I won’t say I liked it the best, but it’s the panel I think about the most. Terry: I keep thinking I’d like to be an editor, so I went to the panel called “Editing.” (Makes sense, doesn’t it?) The panelists were Ginjer Buchanan, a Penguin editor who would be awarded a Solstice Award; Patrick Nielsen Hayden, one of the editors at Tor Books; Trevor Quachri, the new editor at Analog; Stanley Schmidt, the outgoing long-time editor of Analog; and Sheila Williams, the editor at Asimov’s. The most valuable piece of information came from Buchanan and Hayden, who both said they’re looking for “entry level” science fiction; that is, science fiction that doesn’t require a Ph.D. in physics or a few decades of reading science fiction to understand and enjoy. More than that, they said, they’re looking for the novel they don’t know they’re looking for, something new, something different, something that knocks their socks off. Easy, right? Marion: The event also offered a tour of the Rosicrucian Egyptian Museum. Growing up in northern California I had heard about this museum. I had always assumed it would be vaguely campy, filled with Rosicrucian mysticism. To my surprise, it is an elegant Egyptian museum with genuine artifacts and a replica tomb carved out underneath the museum. The San Jose Museum has the largest collection of artifacts west of the Mississippi river, including a couple of human mummies. Terry: I took a nap. I’m exciting that way. Marion: That wasn’t a bad choice. Terry: But then I went to the banquet Saturday night, which was kind of cool. The food was typical banquet fare, but I got to sit next to Saladin Ahmed, who was a wreck because his first novel, The Throne of the Crescent Moon, was up for a Nebula Award. The conversation sparkled with anxiety and good spirits. Marion made it into the room for the awards ceremony. Gene Wolfe got two standing ovations for his Grand Master honors. 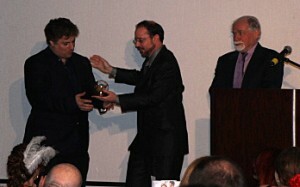 And I was impressed by the Solstice Award to Carl Sagan, who has long been one of my heroes (did you know that they’re remaking his Cosmos series with Neil deGrasse Tyson? I can hardly wait). You can find all the winners here. Terry: Marion left early Sunday morning, but I hung around for one last panel, “Anthologies.” Yep, you guessed it, I have an idea for one. 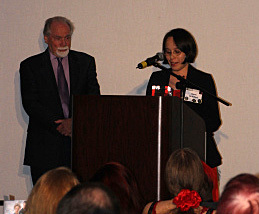 The panelists were Marty Halpern, Rachel Holmen and Robert Silverberg. They all suggested that publishers and marketers prefer themed anthologies that can be described in a single line as much more likely to snag a reader’s attention. Marion: For me, overall, the weekend was about the vitality and energy in the speculative genres. They’re going strong. I loved that there were three “eras” or generations represented in the banquet room. It seems like the speculative genres have been around long enough now to have their “old guard” and their “young Turks.” I liked that. It also did seem like the fantasy wave has crested and the hunger now is for futuristic or science fictional-based stories. It will be interesting to see what that means for us readers. 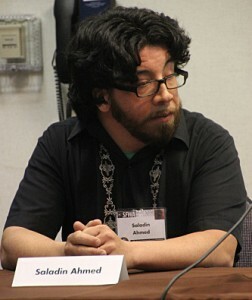 Wow, Saladin Ahmed has a nice head of hair! Thanks for the report, Terry and Marion! I hope I can go someday! That’s a whole lot of awesome people under one roof. Sounds like a good time. Terry why I am not surprised to hear about you hanging around for the anthology session? Put those ideas to work and go get it done!